This is a sneak peek of a Chamaecyparis pisifera ‘Tsukumo‘ that I am entering into the 3rd US National Bonsai Exhibition in NY next month. I’m still working on tweeking it, but I got the custom table today, which was made by Jerry Braswell. I finally settled on which accent planting and jita I would use to accompany it. A little more tweeking and it’ll be really sweet… so this is just a sneak peek for you all. I’ll be sure to get better photos before it actually goes. Eric will be giving his own sneak peek of the tree he had accepted later in the week (when I can get a good photo). Enjoy! And if you love the stand look forward to seeing a more detailed look at how it was built by Jerry. This entry was posted in Bonsai, Design, Photography and tagged bonsai, bonsai styling, focal point bonsai, photography, stand, Tsukumo, USNBE by ang3lsdream. Bookmark the permalink. Thank you so much!! 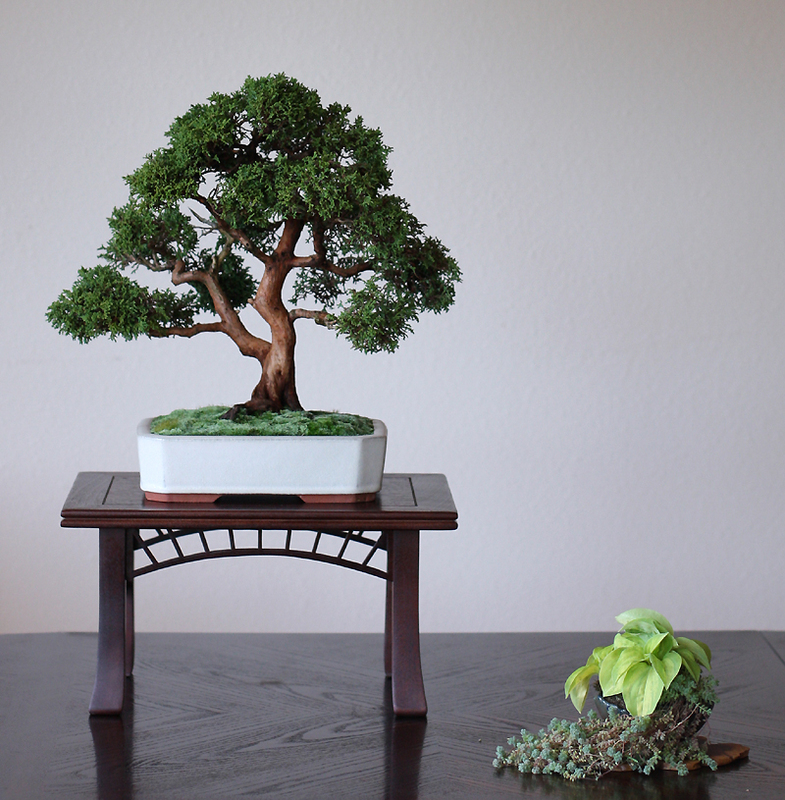 There’s a lot of thought that goes into how one creates a display in bonsai. It’s easy to blow it, and maybe I have… but I am no great judge of it, just an aspiring devotee. All I know is that there is a sweet feeling of serenity in looking at the composition. Beautiful, and congratulations. My goal is one day to have a tree accepted. yes, it’s very calming, and I would say gives a sensation of coolness as well. Very, very, nice. Are you going to have a chance to travel east for the exhibition? It should be an interesting few days. Just lovely, Vic! Two things that I love…the way both pieces reach in an almost mirror image to the left, and the vivid green of the smaller plant. It seems like a small sun warming and spotlighting the tree. Just love it. I am always blown away by how blessed I am to have such a talented daughter-in-law. Can’t wait to see Eric’s tree! See you soon chica!